There are no words for the DISASTER that is going on my family room right now. My wedding is 25 days away and I'm running around like a nutcase. Please bear with me while I'm here there and everywhere. oh wow... good luck you will be fab Im sure about it! 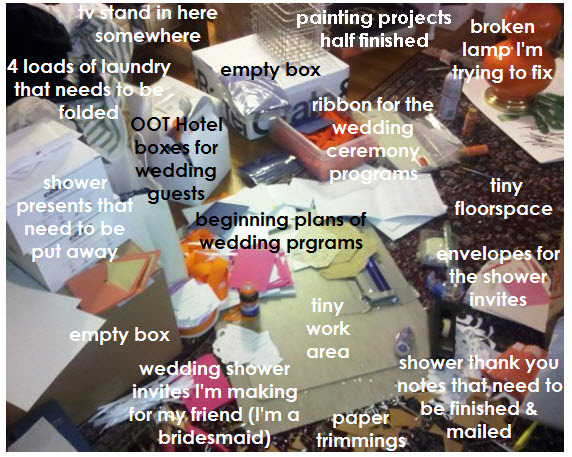 the joys of planning a wedding. i cannot wait to see how everything comes together. good luck!! Love the picture... it put a smile on my face. Sometimes keeping spaces neat and organized is just impossible! I'm getting there...I've still got 10 weeks left to go but I know by 25 days away, I'll be the same if not worse! There's nothing better than a crafty mess. Aren't you dying for a full out craft room? I know I am. Our tiny one bedroom apt. is always cluttered with my projects. Can't believe your wedding is almost here! Remember, each bride is entitled to one hysterical fit before her wedding day! Don't feel bad when it happens. It's TOTALLY normal. what happened to your orange lamp? isn't that they lamp you won?! our apartment was basically transformed into an arts & crafts center in the final weeks leading up to our wedding. it will get better! Good luck. It will be worth it when everything is done. somehow, it all ends up working out... with a wedding, there are so many things to get done, but it will be SO worth it in the end!! sending you good vibes!! wow...i've been a bit absent from reading a few blogs lately (as i prepare to move to india in less than 2 weeks!) but i can't believe your wedding has come so quickly! time flies! i'm sure everything will work out perfectly...it's totally understandable that things re a bit crazy right now! 25 days away is quite exciting!